I simply adore observing the ways and the wiles of Mother Nature—even better when I get to actively take part in her processes. Composting is just such an activity. On this page you'll see photos of my relaxed style of composting. The photo below shows the ingenious contraption created by one of our Village Administrators, Fred (seen on the left). He built a box out of plywood and chain link for the back of the Village truck. 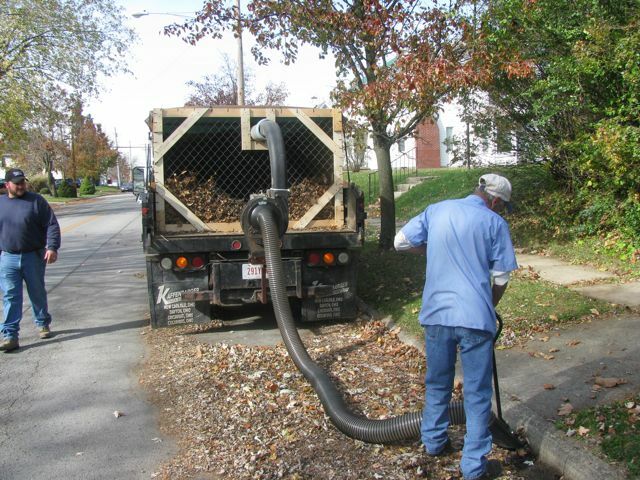 He then repurposed a blower to become the vacuum so they could pick up the leaves from our streets before they could clog the sewer drains. I ended up doing some research for the Village Council on the viability of composting the leaves on a village-wide basis. Though it seems like a very doable project, I'm guessing there isn't enough money/time for the training to get the EPA-approved site up and running at this point. Still... I have hope!